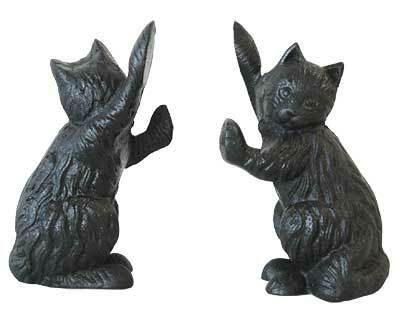 Catch the eye of any cat lover and prop two doors open using these Esschert Design Cast Iron Cat Door Stops. This set of 2 adorable, cast iron felines perfectly showcases your love of these pets, while their unique shape and hefty construction easily hold open doors. Each cat sports an inquisitive expression and raised front quarters, with the front paws extended outward to form functioning door stops. Their hindquarters and tail rest on a level surface, providing stability to the pieces, while striking detail on each unit enhances the motif. The all black finish offers a timeless hint, and the cast iron construction is fantastic for indoor or outdoor use. Help two doors remain open and under the watchful gaze of cats using these Cast Iron Cat Door Stops. Note: This case pack contains 2 of the Esschert Design Cast Iron Cat Door Stops.